Blog : Pound shop or premium? When I was young my Dad drove the kind of car money just cannot buy any more – the large, ordinary family saloon. It’s what Dads did back then – bought a big car cheaply, whether a Renault 20, an SD1, a Fiat Argenta or any number of mainstream, but not ‘quite’ luxury models. I remember quite clearly my Dad trading his Granada GL for a three-year-old Carlton CD. Now, wearing my Dad’s shoes, I’m in the same boat – except that boat isn’t for sale anymore. Family saloons have graduated into family executives; if I want a large car for a lot less cash I still just about have a (ever-depleting) choice. Ford’s Mondeo, Vauxhall’s Insgnia, Peugeot’s 508 are all still available in reasonable numbers. The once ubiquitous Laguna is now only spotted by detective agencies, Nissan’s Primera morphed into the capable Qashqai and a used Accord or Avensis costs as much as a used Lexus now. The Passat went all posh, though VW Group’s Skoda still serves up a choice of Octavia or Superb. Sadly, Rover’s long gone. Even by adding all the above up, you will likely find they are outsold by the BMW 3 Series. Desirable new and used, they make far more sense to the Financial Director than the cliff-face residuals of some of the above marques. Of course, the family hatchback is plentiful – you can chose a Focus or, maybe, a Leon, but there never seems to be quite enough room for three abreast in the back or two weeks of holiday belongings. What alternatives remain, then? History often reminds us of the alternatives. Cheap cars have always been available but, let’s face it a ‘brand new’ FSO, Riva, or the Estelle couldn’t hold a candle to their contemporary used peers. Octav Botnar’s Oriental invasion through the ’70s into the ’80s (Datsun) made headway, until Datsuns and Nissans cost as much as a regular car. Luckily, those crafty Koreans spotted the gap in the market and filled it (the ghost of George Turnbull in action) until the point where a Hyundai-Kia now costs the same as a regular car… déjà vu? Okay, so who is 2017’s (or, more accurately, 2018’s) new challenger in the ‘new car for used car money’ stakes. Well, I’m sure you know – even if you didn’t, the current viral tide of this bargain basement brand is flooding the web. Dacia. Yup, we know it’s Renault/Nissan leftovers in a frumpy smock, bare metal aplenty (and not in a Fiat Coupe way either) and hard touch plastics. However, £8999 for a new family car is headline news. We know only a dozen people will buy the £8999 model a year (in domestic white finish only) but you could, should you want to do so. Will it kill the four-year-old, fresh off lease executive market? Of course not, curtains will always need to be twitched. But it might fill the ‘dad’ market until you can buy ‘dad’ cars again. Ultimately, it seems the modern motorist is stuck with pound shop VFM on one side, executive costs on the other. Nothing in the middle. Anyway, have a peek at the Dacias in your local Renault franchise and report back – I would be intrigued to know whether you’d sign on the dotted line or the German flip key is where your heart lies. Now he’s busy working towards retirement. Hmm. My old man’s in the market for a lightweight off-roader for light farm duties. In the end he plumped for a 55-plate Grand Vitara 2.0 petrol but he did look at the Duster information at the local dealers. The thought of a new motor with a fair bit of warranty for £9k did appeal, and I can see many of the dusters selling to livestock farmers as a 2nd/wife’s car which doesn’t need the heavyweight towing and off-road capability of an L200/Defender/Disco but does still need limited 4WD and ground clearance. Back on the subject, I don’t think modern Skodas are in any way ‘Poundland’ choices- they occupy the place that Volkswagen used to have before it went premium. The Dacia will probably sell in small numbers to the kind of private purchasers who bought Berlingos and Kangoos as family car- I doubt if the residuals will be good. The thing is, my local dealer has Skoda & Dacia rubbing shoulders. 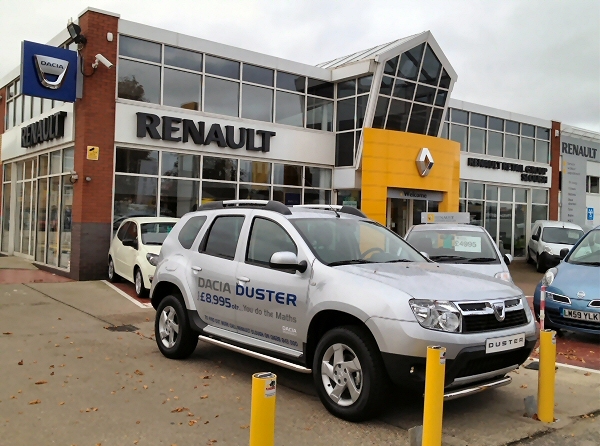 The Duster is a hell of a big car for the money, and will appeal to those who want a lot of room, for not a lot of cash, and I think it will do OK, especially to the ‘grey’ market, who want a car that is easy to get in and out of. I’m waiting for a go in the new Sandero. I couldn’t care less if people think I’m a skin flint for appreciating the Dacia brand. The big people carriers have filled the big car gap, to some extent – Ford Galaxy for Granada, for example. And the Skoda Superb is a good value big car from about 17grand. I’d be very tempted by a low mileage Mondeo or Vectra for about £7000, to keep for a long time. @ Johnathan Carling, modern Mondeos get to about 3-4 years old, then become bangers, too many things go wrong with them, especially the diesels, and the Vectra, well, not Vauxhall’s best effort as a family car, and finding low milers of both is honestly a slim to no chance, as both have had hardly any private buyers. The sad fact is, the Dacia will go ‘upmarket’ eventually, as the profits will be chased when they can. Renault are in trouble anyway and I feel they need Dacia for cash flow. I have the sinking feeling, that the ones to stay with real VFM cars will be the Chinese. They so take the long view about things, that we don’t get it. Plus, they really need VFM cars themselves in numbers that terrify other manufacturers. Spain and France is full of Dusters, so they cannot be too bad. I doubt most Brits will be able to get over the brand snobbery. Will be going to see the Sandero as soon as they have one. What has changed from the days when “dad” bought the large Ford or Vauxhall barge by default, is the influence of Euroncap. “Dad” will now be looking for the mainstream 5 star Euroncap rating, that Renault themselves pioneered with the Laguna in 2001. Oddly, for Renault, the Dacia’s Euroncap rating is dreadful by current standards, with each of their 3 cars only managing 3 stars. Until they fix this, they will be bit players in the family car market. Skoda Superb is the only modern day Granada/Carlton substitute…. However put an Insignia or Mondeo next to a Carlton or Granada, and they are the same size, despite being badged as the size below. Take into account more efficient packaging and use of space inside, and these are in effect the decendants of the big Ford and Vauxhall barges, and probably sell in bigger numbers too. I work for a multinational organisation, with ultra strict company car guidelines – I have a top spec Skoda Superb estate, while the guys below me are in BMW 3 series – who’d have thought of that 25 years ago! Look where Renault is in the UK market-the vans,Twingo,Clio and Megane,hardly big hitters in the sales chart.Setting that aside,this parts bin Duster represents amazing value-even against a Great wall 4×4.This car should do well,i wonder if Renault think so too. I see that adding the (virtually essential) diesel option adds £2,500 to the price of the car, with 4 wheel drive another £2,000. They aren’t stupid; I’ll be interested to see what deliver time’s they’ll be quoting for the entry level car…. And another thing of interest; there’s no haggling allowed on the prices. That’s the first time I’ve heard that since Daewoo. It is not legally possible for a manufacturer to control the price a dealer sells a car at, but it is possible if the manufacturer and the dealer are the same company (as in the case of the defunct Daewoo). So how come this vehicle seems to be being sold by a dealer? Is Dacia really downmarket of Renault? No-one has really aspired to a Renault for some time so when the opposition started making markedly better cars than them the problems began. Regarding Chinese cars becoming abundant: if SAIC / MG actually get a few more cars across the water, and allocate a sensible and ongoing budget for marketing, they may well lead the way. If MG would sort out the MG5 to European standards, and if the new MG6 is as good as the press shots show with hybrid power (which I’m no fan of – diesel all the way for me…) I think they have a good chance of not just surviving but growing substantially. Oh, and sort out the ancient MG3 too, talk about long in the tooth, Jeesus. As for Rover’s return – I wish. Cant see it happening though. I bought a new Chevrolet epica in 2009 which is just the sort of car you are talking about. It cost me £11k brand new from a main dealer, and an extra £500 bought me 3 years/60,000 miles service. I was recently offered £2500 part exchange against a new MG6. So what? I’ll keep it until the first big bill. It has been very good to me; much more reliable than the Mondeo it replaced and I will mourn its passing. Budget Renault ? Thats a laugh. We had a fleet of Laguna 2 diesels about 10 years ago. I lost count of the number of blown engines/turbos/gearboxes/suspension faults. Not a single one made the 4 years 150k without a serious fault. Unlike the petrol mondeos, astras, cavaliers that we had before. Big saloons are dead. I lament this fact too. Between the obsession on one hand for SUV school run tanks, hence the Primera getting replaced by the qashcow, and on the other some sort of badge snobbery that insists that saloons have to have propellors or rings on them. Interestingly if you visit a Renault showroom in Ireland they’ll sell you a brand new Laguna or a Fluence (non-electric). So it isn’t a RHD thing, just UK. Skoda were a budget marque, made good cars, are now what VW used to be, and VWgroup are now thinking of introducing a budget marque!! Superb is probably a successor to the Granada of old, certainly ubiquitous thanks to taxi fleets. Chrysler 300 is another consideration. 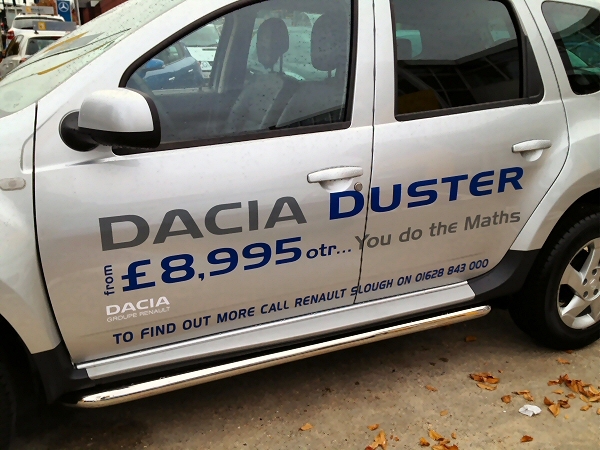 “From £8.995” for a Dacia Duster – you can’t get vexed at that, can you? Guess it’s residual value will plummet though… but if you want a cheap car that’s practical and NEW… look no further? This pheonomenon isn’t that new – when you think how much the budget sector was shook up in the late ’80s and early ’90s when Proton came along (and at the same time Hyundai started to get “good”), they all but killed off the Eastern Bloc stuff overnight, but although they were cheaper than the mainstream European metal of the time, they were still thousands more than Lada/Yugo/Skoda/FSO. But the market took to them nevertheless. I think there are a number of things at play here – firstly the boundaries between the mainstream marques and the premium brands has become increasingly blurred. A Ford Mondeo is as good a car as a 3-Series or an A4 in every area except brand prestige, whilst at the bottom end it really is getting hard to make a bad car now. Because of platform sharing, they are all pretty much the same under the skin, and customers themselves are becoming increasingly sophisticated and whose minimum expectation is a lot higher. It would be a brave maker who came up with a truly ‘no frills’ car these days – one with wind-up windows, no central locking, bare painted metal finish inside, cheap upholstery, rubber mats, none of the electronic wizardry, and no airbags, ABS etc. Certainly in terms of airbags, ABS, traction control – are all of these not mandatory? You should have gotten whoever serviced them to check and clean the EGR valves and associated bits. Once the engine ate those the next thing on the menu was the turbo (I would guess because combustion temps went skyward faster than a suicidal DB606) and goodbye engine. This has been a known issue for years. In over 10 years of ownership we’ve never had problems with Renaults other than electrics and wear and tear stuff, ironically the merc my dad has now ate its turbo at 30k. Safrane II did 100k and didnt miss a beat, not to mention was showing engine wear equal to a 20k car. Why? Becausse it was looked after, wasnt ragged, was properly run in, and serviced by people who had a functional IQ higher than the top bump stop on a Morris 1000 speedometer. As with everything these days, take care of it, it will work. Try to skimp and it’ll do the OHC equivalent of K19. I bought a new KIA Optima 2 luxe 2 months ago, got a car the size of a 5 series and fully kitted out with every toy I could need, leather interior and a 7 year warranty all for £20,000. Could not get a new so called mainstream car near for the money and need at least a further £20.000 – £25.000 for a so called premium car. I will keep it for at least 7 years so think I got my moneys worth. @ Steve, I think that was my point that the mainstream makes and the once “budget” makes boundaries’ have become blurred. I was in a new Hyundai IX35 the other day and I couldn’t believe how upmarket it felt, there was none of that cheap, plasticky feel that Korean cars used to have not that long ago, in fact it felt as well put together as anything Germany’s best could muster – Kia/Hyundai really aren’t the poor relation anymore, they are firmly in the big league now with everyone else. What about poor old Proton though – they’ve suffered since the tie up with Mitsubishi was severed, and they keep desperately trying to cash in on their Lotus association, but read the reviews – the cars are crap and the public have been voting with their feet – a shame really since it was they who originally showed us that budget cars don’t have to be awful cars. @23, There must be a market if only niche,the amount of people i speak to whom are sick to the back teeth of electrical gremlins,parts prices and everything coming “as a module”is almost a joke.We do need another 2CV and the world has one the TATA nano-but is anyone that brave? @20 The MK2 Laguna epitomised unreliability,a fine looking and comfortable car that could never stay in one piece,in particular expensive trim components and forever failing rear axle bushes.Turbocharger failure due to stuck shut EGR valves thus preventing the wastegate effect and resulting in turbine overspeed and then if unlucky the engine taken with it,i do know of a few high milers but these are carefully looked after. On my journey into work I regular saw the absolute bog standard white Sandero coming the other way. What got me was that it had a personalised number plate!. The Duster looks really good. I think the trouble with all of the old-style “dad” cars is that they weren’t that useful at times, i.e. they were large but because most had a boot with no folding seats you couldn’t carry stuff which you often need to. Today’s SUVs and the fewer remaining estates are way more practical and just better family vehicles. Seems ironic that the MG6 has only been mentioned once in this. If Dacia didn’t skimp on paint and stuck to simple/easy to maintain they could clean up if they widened the model range. I still think there are some basic cars built in India and Indonesia, eg Honda, Toyota/Daihatsu, that would sell well in the UK although lack of certain technology wouldn’t help their NCAP ratings. We have 3 Dacia Dusters on a fleet. While not popular with our drivers because of badge snobbery and to be fair they aren’t the most attractive car to be seen in, they have averaged 110,000 kilometres in three years and other than one window regulator have proved very robust and reliable. In terms of buying something priced well and attractive to own, people should consider the Fiat Tipo. We have 2 on the fleet and they are great little family cars. Contrary to legend, they are beautifully built and immensely reliable and take everything we throw at them. Very impressive car and great value with good spec. In fact, the Dusters and Tipos are proving more robust and reliable compared to the so called premium cars we have. Mercedes-Benz C-Class lovely but interiors not robust, BMW 3-Series very disappointing in terms of reliability, Audi A4 and A5 excellent but EGR issues, Lexus 200 great car and Jaguar XE the most impressive particularly in terms of driving and reliability. As a fresh owner of a Tipo, I can confirm all of the above. Very good value for money, mine is a zero-mile example which I paid peanuts for, even considering that it’s the access version. Drives well, quite comfortable, it does not want to look like a Golf competitor – it is not and they know it at FCA this time. 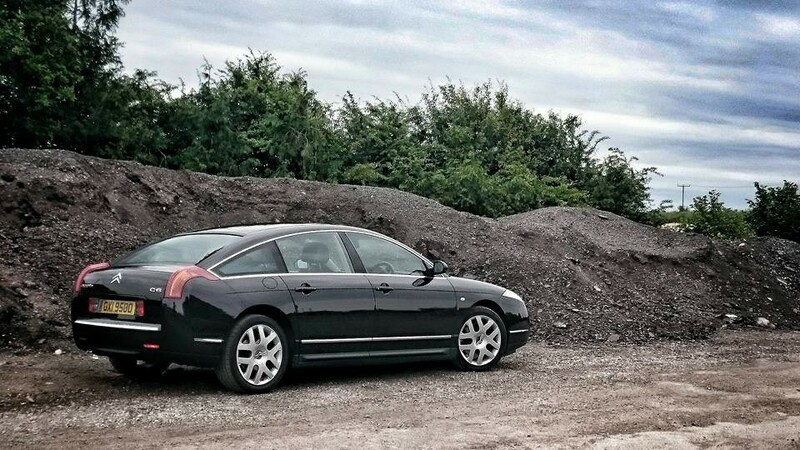 Too bad you guys across La Manche do not get the four-door saloon – that *really* is a true dad’s car. Boot space is quite impressive and it has a pleasant exterior too. I was inches from getting it but wife apparently was not happy with that boot arrangement, and yes we have a dog as well so I sadly let the saloon go. Side note – this great little site gets better every time I come back here for a read. Chapeau. Ireland gets the saloon Tipo, popular as a hire car (as most small saloons seem to be). Good looking variant, as is the Megane “coupe” saloon. One thing I did notice though is that Ford Ireland dropped the Focus saloon entirely. Whoops – sorry, I was quite convinced that since UK cannot get the sedan, the Irish market couldn’t either. Thought that its RHD version did not exist at all. My bad. Another dad car that was very popular locally, the Proton MPi, a car that could carry five people and their luggage easily, was considerably cheaper than its European rivals, and had unbreakable Mitsubishi engines. Ditto the Hyundai Stellar, if a bit larger than the Proton, a Sierra rival for considerably less money and loved by local taxi drivers for their low prices, excellent reliability and big boot. A lot of Lada dealers transitioned to Proton dealers. They were popular for a while, proven Japanese tech (albeit previous generation Mitsubishi) at a low price. Seemed to go downhill when the likes of Kia found their feet, and Proton started designing their own cars. Stellar was advertised by Hyundai as a spiritual Cortina replacement, from the company that had previously built the Cortina in Korea – the old fella had one for a while as he didn’t take to the Sierra. Early models had some Cortina parts commonality, but I think that this was reduced over the model’s lifespan. Engine was Mitsubishi, however he had issues with the rest of the car not taking well to general wear and tear. Early models, before the big federal bumpers, had a look of Maserati Quattroporte about them. Proton is effectively dead over here, severing the link with Mitsubishi and not finding another partner who could supply them with reliable technology on the cheap killed them. The Gen 2 and the Satria were way behind their rivals in terms of refinement, driving ability and quality, and this killed Proton off. Had they made a deal with a company like Toyota to build cars based on their older at a competitive price, then Proton could still be doing well. A car like the Dacia Logan, an estate which starts at £ 7000 and using Renault engines, proves that a cheap, reliable family can still be made. Proton fouled-up badly when they launched the GEN-2 too early in 2004. The fact they continued to develop it into something like it should have been from the start by the time the series2 cars came along was all just too late,(sound familiar?) The UK mags kept recycling roadtests of poor 2004 launch cars, (and still do) and Proton gave-up on the UK market somewhere in 2010 anyway. Did Proton think they could do the same as Hyundai & Kia by stopping their reliance on Japanese parts & going their own way? Proton rely almost entirely on the home market, and have hidden behind trade tariffs for a long time. Not wanting to oversimplify too much, but this protection from competition meant that they were ill suited to make cars that are competitive on the world stage, and once the “complete and utter skinflint” market in the UK was saturated the wheels came off their export venture. Last I read Geely had bought a controlling stake, so things might be looking up for them. I’d heard that Proton had the benefit of a protectionist home market. The Persona and the MPi had the benefit of using older Mitsubishi designs and engines that were well known for being very reliable, and people recognised the cars from when they were Mitsubishis. The GEN 2 failed as it was a completely new Proton design, but looked very old fashioned, and the Proton developed drivetrains were unrefined and not very reliable. Sales nosedived and the local franchisee gave up in 2011. Ironically the showroom is now used by a SEAT dealer, whose cars once competed against Proton in the budget market, but now are highly respected. A friend bought a new Dacia Dustbin – sorry Duster and I put rear parking sensors on it. I discovered basic mechanicals and what seemed very thin metalwork with thin sound deadening material stucj in places. After 6 months the edges of the panels started showing rust. Dacia told him it was an isolated incident and it went back to the dealer for rectification who told him that they had ‘done loads’. He traded it in – MG3 – and lost a whole heap of money. I don’t think this is a problem on the Sandero, but the problem with buying any Dacia is you’re buying cars that are built to a budget and use old technology, which means trading them in outside the Dacia network is difficult. I reckon the Sandero and Logan are tempting buys, if you avoid the too basic Access model, and seem to be OK for reliability, but the 1.2 Renault engine on the Access and Ambient is rather slow and not particularly quiet at speed and the diesel option makes the car less of a bargain. I’m sure it would be possible, like Dacia have done, to build a Focus sized car that retails for under £ 7000. India has now proved it can build reliable, modern cars for companies like Suzuki, Hyundai and Nissan, and I’m sure a car made in India or Thailand( like the Suzuku Celerio), powered by a drivetrain from a company like Toyota for trouble free use, and sold alongside Toyota, could do very well. Maybe not as basic as the Dacia Sandero Access, but so long as the car has the necessary safety equipment, a CD player, tinted glass and front electric windows, it would sell as many buyers don’t want an infotainment system and everything electrically powered. I agree the Logan MCV is good value for anyone wanting a new cheap Estate car (perhaps self employed wanting to carry tools and equipment). The new Micra is made in France, and looks a lot more modern than the Micra I have now, which was made in India. However, it has never let me down once, still does 50-60 mpg. and doesn’t rattle like the Fiesta I had before it, which also liked its petrol quite a lot( 37 mpg around town and 47 mpg on a long journey). I’ve had my Micra from the same generation for 15 months now & it’s not given me any trouble so far. The MPG & tax were cheaper than the Toyota Yaris I had before. It’s not the most exciting car to drive, Richard, but everything works inside, the economy is good and it does me in my current financial state. Of course, the new one is a lot more modern looking, resembling a Honda Civic, and a very desirable car, but it’s too expensive for me. The new Micra is almost a scaled down Pulsar style-wise. I managed to get a good discount on mine as it was one of a batch pre-reg cars that had sat around the dealers yard for months & they wanted to shift them as the new model was being launched, as well as the switch between 66 & 17 reg. They did try and build the Cherry in Italy but it was a disaster. The Bluebird built in Washington was a bulletproof car, though a shame most ended up minicabbed to death, not many survivors. Quite a few were bought by older drivers which meant they were looked after, but a lot them have ended up being left on driveways or in garages as the owners get too old to drive. Certainly the number on the roads near me has dropped off in the last 5/10 years. Yes the Cherry “Europe” in standard & GTi form built by Alfa was not a success, neither was the ARNA equivalent… despite having the Boxer engine. The first production Nissan Bluebird, built at Sunderland (a white 2.0 SGX known as JOB1)is now displayed at Sunderland’s Museum. The first trial build Bluebird was a white 1.8 Turbo ZX known as T1. Peugeot 309 Cool, electric front windows, stylish 2 tone graphics, a semi decent stereo, power steering, sunroof and that’s your lot…….nothing else to say. No air conditioning either to improve the stuffy dreadful heater linked ventilation system either, which would be a boon on this car and make it bearable on warm summer days. @ Anthony, air con was rare on most cars of this size 30 years ago. Possibly Cool meant the graphics and sunroof, which were a big deal on cars then, and front electric windows tended to be something you’d get on top of the range cars, so the 309 Cool wasn’t all bad. Yep… multi colour stripes, tilting glass sunhatch’s and vinyl roof’s were very popular on many cars in the late 70’s / early 80’s. A lot of dealers had stripes applied to new showroom cars whether you wanted them or not. Oh, also chrome plastic wheel arch mouldings were offered. Had some on my Cherry coupe and they looked rather good. Go back to the eighties and the true pound shop car that could seat four adults in relative comfort was the Lada Riva. While the basic 1200 model was awful, the 1300 models, particularly those in SL trim with a five speed gearbox and velour seats, were a real bargain and could cope quite well on the motorway. Even better was buying one used at about three years old, as the trade didn’t want to know and used values were on the floor. I remember my local Lada dealer in the early 1990s advertising a basic Riva for £3333, claiming it to be the UK’s cheapest new car. The Riva would be nearly £ 7000 in today’s money, about the same as a Dacia Sandero Access, which like the Lada has no radio and uses wind up windows, but unlike the Lada, the Dacia has tinted glass, a rev counter, and has modern safety equipment like airbags and seatbelt pre tensioners. It does prove one thing, a basic car can be made for the same money in real terms as a Lada Riva, but with a more modern driving experience.